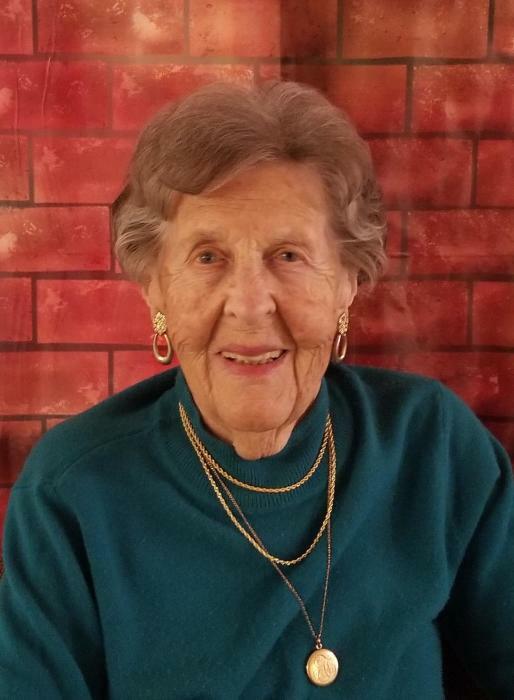 Obituary for Doris M. (Miller) Coyne | W. Orville Kimmel Funeral Home, Inc.
Doris M. (Miller) Coyne, 99, formerly of Bellevue Park, Harrisburg, passed away March 20, 2019 at Homeland Center. Born March 15, 1920 in Scranton, she was the daughter of the late Karl and Vena (Traher) Miller, was a graduate of Scranton Technical High School and received her Associate’s Degree from Lackawanna Business College. On September 14, 1946 she married Paul F. Coyne, raising two children and traveling the world. They moved to Harrisburg in 1975 and Doris immediately loved the area and started volunteering – ushering for the Symphony, working as a docent at the Governor’s Mansion, serving the homeless, taking mission trips, and, through her church, Pine Street Presbyterian Church, she started visiting residents at Homeland Center. She ultimately joined the Board of Managers there and served for over 20 years. In 1981, after 35 wonderful years of marriage, her husband passed away. Following his death, Doris worked temp jobs for Kelly Services as a “Kelly Girl” and was awarded the “Kelly Woman of the Year”. During her time with Kelly, she was a tour guide with HERCO and Hershey Test Kitchens, and a registrar for seminars. She also ran her own small travel agency. Doris was a member and former deacon of Pine Street Presbyterian Church and was a member of the Harrisburg Civic Club. Her greatest joy, though, was traveling. Always hunting for new experiences, she has visited 29 countries and was still an active member of the Greater Harrisburg branch of Friendship Force International, which promotes personal interaction among people worldwide. Through this, she still has friendships from all over the globe. She loved water sports, kayaking for the first time at the age of 75, and especially loved going to the beach. Since becoming a widow, she has been spending a great deal of time in Ft. Myers Beach, Florida. Even after moving to Homeland, Doris remained engaged in activities, and has become a favorite of the staff. Her family sends their deepest appreciation for the care she got from her Homeland family and more recently from Homeland Hospice. Surviving are her children: Richard Coyne (and Diana), Lancaster and Janice Coyne, Lake Mary, FL; four grandchildren: Kristin Coyne, Kevin Coyne (and Aimee Lim), Jeffery Hoeflich (and Angela) and Andrew Hoeflich (and Dawn Bainbridge); 5 great grandchildren: Kyle Hoeflich, Thomas Hoeflich, Andrew Hoeflich, Nicholas Hoeflich and Ava Hoeflich; and her former daughter in law: Linda Coyne. There will be a memorial service at 11:00 AM, Saturday, April 13, 2019 at her church, 310 N. 3rd Street, Harrisburg where a visitation will begin at 10:00 AM. The Rev. Dr. Russell C. Sullivan, her pastor, will be officiating. In lieu of flowers, donations may be made in her memory to Homeland Center Benevolent Fund, 1901 N. 5th St., Harrisburg, 17102; Pine Street Presbyterian Church, 310 N. 3rd St., Harrisburg, 17101; or the Civic Club of Harrisburg, 612 N. Front St., Harrisburg, 17101. Kimmel Funeral Home, Harrisburg, is handling arrangements. W. Orville Kimmel Funeral Home, Inc.